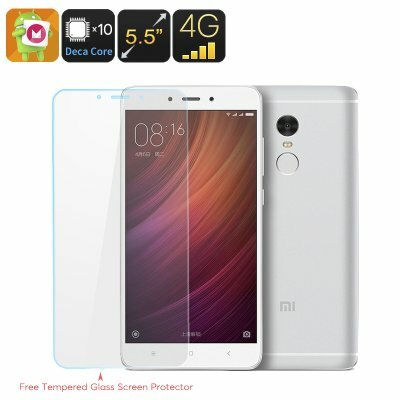 Successfully Added Xiaomi Redmi Note 4 16GB Smartphone - Dual SIM 4G, Android 6.0, Fingerprint Scanner, Deca Core CPU, 2GB RAM, 16GB Memory (White) to your Shopping Cart. With its sleek and stylish design the Xiaomi Redmi Note 4 is the 4th edition of the Chinese smartphone that has become known as the large screen flagship killer. Featuring a full metal design with a brushed finish and holding a massive HD display, this Android phone truly stands apart from it competitors. The latest version Note 4 benefits significantly from its Deca-core Helio X20 chipset that is backed up by 2GB of RAM. With its powerful hardware, this Chinese smartphone delivers a smooth and lag-free user experience, allowing you to enjoy the latest FHD movies and most demanding mobile games without dropping a single frame. Controlling all this magnificent hardware is a Miui 8 operating system that has been based on Android 6.0. With this interface you are free to enjoy the latest features the smartphone industry has to offer. The centerpiece of the Xiaomi Redmi Note 4 is its large ultra-bright 5.5 inch display that boasts FHD 1080P resolution. Having a maximum brightness of 450 nits, this display effortlessly outperforms its competitors and lets you enjoy all your media in stunning detail even when you’re outside exposed to the bright sunlight. Featuring Dual-SIM and two IMEI numbers this Android phone allows you to be reachable on two different mobile numbers simultaneously while using just one device. 4G connectivity additionally enhances your user experience by providing you with the fastest data transfer speeds out there – letting you stream and download the latest media in the blink of an eye. With the Xiaomi Redmi Note 4 there is no need to ever worry about running out of storage space. Holding a massive 16GB of internal storage and the possibility to add an extra 128GB of space, this Chinese smartphone offers plenty of space for you to store all your music, games, videos, and more. Additionally, an ultra-fast fingerprint scanner lets you secure all your data and provides you with effortless access to your phone in the fraction of a second without the need to ever remember those bothering passwords and access codes again.